Take your business to the next level with LenovoPro Stores. • Purchase total of SG$12,000 and be upgraded to Lenovo Pro Plus! • Purchase total of SG$25,000 and be upgraded to Lenovo Pro Elite! 1. “LenovoPRO Tier Upgrade Offer” offer period : 1November 2018 to 31 December 2018. 2. Select LenovoPro tier users who successfully purchased over SG$12,000 will be upgrade to LenovoPRO Plus tier. Select LenovoPRO Plus tier users who successfully purchased over SG$25,000 will be upgrade to LenovoPRO Elite tier. 1. Net30 is a 30 days payment terms for selected customers’ purchases on Lenovo (Singapore) eShop LenovoPRO store. 2. Only selected customers from [LenovoPRO Plus] customer tier are entitled to purchase with Net30. 3. Selected customers must complete theNet30 application form, provide the required document, and sign the Customer Agreement in order to apply for Net30 in their real orders. Customers shall contact Lenovo (Singapore) eShop Quotation Hotline (800-601-1481 Singapore Toll Free) to obtain the application form via email. 4. Application for Net30 will be reviewed and subject to approval by Lenovo (Singapore) Limited at its discretion. 5. Maximum credit of Net30 is SG$50,000 under same company account. 6. Payment must be settled by bank deposit to specified bank account under Lenovo (Singapore) Limited. The bank account information will be provided by Lenovo Account Receivable team after the Net30 has been reviewed and approved. 7. Any amount not received by Lenovo (Singapore) Limited within 30 days of receipt of invoice shall be overdue. Customer shall pay a late payment fee of the lesser of one and one half (1.5) percent per month or the maximum rate permitted by law on the undisputed overdue balance of the invoice amount. Invoice will be sent to customer’s email address. 8. Lenovo (Singapore) Limited may request payment before the payment is overdue, customer shall immediate settle the payment to the specified bank account. 9. In case of dispute, Lenovo (Singapore) Limited reserves the right for final decision. Join now and enjoy exclusive member-only offers and products tailored for your business needs. What are the LenovoPro Levels? LenovoPro offers Small to Medium Businesses next generation technology, solutions, and services. From exclusive offers, personalized products & solutions, to business financing, LenovoPro provides a hassle-free buying experience that understands your unique needs and expands service levels as you grow. Based on decades of experience servicing businesses of all sizes, Lenovo offers an entry-level tier which allows small businesses to take advantage of benefits often only provided to larger companies. Receives our exclusive offers on a basic level with entry-level members-only offers. Curated specifically for businesses who spend SG$12,000 per year on new technologies and looking for a step-up in services from subcription-based infrasctucture to dedicated sales support. ProPlus provides an expanded level of savings and finance options to help increase flexibility of cash flow and help your business continue to grow. Receives our exclusive offers and a dedicated Small Business Advisor, as well as bigger discounts on products and services. Our ProElite tier is for businesses who spend more than SG$25,000 per year. 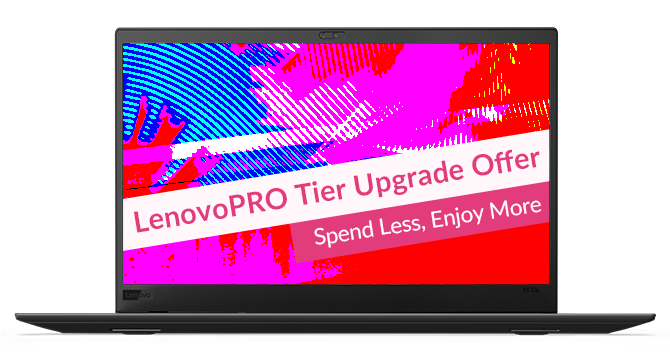 ProElite level members enjoy our highest level of savings on all of our award-winning Lenovo solutions and products. Receives our exclusive offers and a dedicated Small Business Advisor along with our best discounts on products and services. You'll save more as you buy more with LenovoPro. LenovoPro offers three membership levels with perks and discounts. All backed by Lenovo's dedicated support team and first-class finance options.